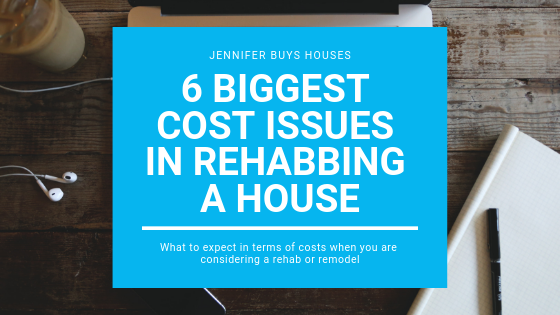 6 Biggest Cost Issues in Rehabbing a House | The Shenbaum Group, Inc.
What are the biggest cost issue in rehabbing a house? It’s a 50/50 toss-up between people who know what it costs to remodel a house to sell and those who “think” they know what it costs. Homeowners who are thinking of selling their house typically fall into the category of only “thinking” they know what is costs or entails. And, trust me, I only know from doing so many projects. In the beginning, it wasn’t pretty…. Plumbing and Sewer – If your house is older (anywhere from 20 years to 100 years), chances are that some of the plumbing isn’t up to code by today’s standards. Not to mention the age ofyour water heater, the type of pipe you have (galvanized or copper – copper is good, by the way), and oh, let’s talk about those back-ups you’ve had recently. That is a sign that your sewer line might be in need of replacement or repair. Tree roots are often the culprit here. Electrical – This is a very important safety area for new homebuyers. While they might be okay with cosmetic things, having updated electrical that is to code is HUGE. The buyer’s property inspector will pay close attention to grounded outlets, GFI-protected plugs, wiring in the attic, exposed cords and wiring, and the electrical panel. Most electrical panels in older homes are not appropriate for today’s electrical use. Think about all the things that are electric, that we didn’t even have in the 50’s and 60’s. Foundation – Your floors probably slope in some way and there might be some cracks in the foundation. That might be okay up to a point, but with severe slope and extensive cracking, you are looking at a huge cost to fix. Lenders might not even lend on a home with foundation issues, so address them early. Mold – Hopefully, you don’t have any mold, but you might not even know you have it. It often hides in walls where you have a constant leak (that you can’t see), or it’s under cabinets, or in the attic or crawlspace. Mold has to be remediated, the source of the water repaired, and the wall (drywall, wood, etc) should most likely be replaced to ensure the mold is gone. Remodeling – Now we can talk about making the house look nice with upgrades like new tile, flooring, paint, hardware, etc. That is, if there is any money left over after taking care of 1-5 above. I guarantee you that in this environment, homebuyers want a good-looking house AND a house that isn’t going to require huge costs in the first few years of homeownership. Homebuyers will have a property inspection and will most likely be told the condition of 1-5 above. Homebuyers will either ask for all the repairs to be made before close of escrow, a large credit back to them, or they will back out of the deal. This is happening more and more, so be prepared.